At the end of summer in the city on the Neva will take place, we can safely say, a milestone, or rather the concert of the legendary rock group "Metallica". August 25, 2015 at the JCC "Petersburg" will be an explosive fire show . It will be of interest to fans of "heavy" music rent the apartments in the Northern capital. the World-famous American group was created on 15 October 1981 in Los Angeles, the two musicians Lars Ulrich and James Hetfield, and next year will celebrate its 35th anniversary. For connoisseurs of such music styles like heavy metal, thrash metal, speed metal and hard rock musicians of the group are unsurpassed masters. The group has in its Luggage 9 released albums that sold around the world billions of copies and brought the group international fame and success, but also huge profits. Not just music albums became gold and platinum. With them willing to cooperate, a major record company. Among the well-known music labels, it should be noted such as Warner Brothers and Sony Music. Metallica often in different parts of the world as part of a world tour. In the biography of the band even have a performance in Antarctica. Interestingly, the audience at a concert in Antarctica enjoyed their concert in the headphones, so as not to disturb the fragile ecology of ice continent. It should also be noted that the band "Metallica" is the only one that visited with the centers on all continents and at the same time all six continents were visited in the course of one year, which is actually kind of a world record. 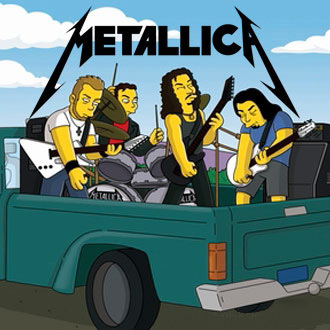 Music Metallica "infiltrated" even in the form of animated and feature films. So in the movie "Mission impossible 2" sounds like the single I Disappear, and in the animated series the Simpsons (Simpsons) involves their animated counterparts. They are so popular that with the success so far, introducing the horror bhoopathy old women and citizens of all countries of the world. Knowing that Guantanamo prisoners were tortured Iraqi music performed by Metallica, James Hetfield joked, "We tortured his parents and wives of our music for many years. Why not torture it for the Iraqis?". Now these legendary "torturers" in our country, and will perform an unforgettable concert. Venue: Peterburgsky SCC on 25 August 2015 at 20 hours.